Kids aged nine to eleven are on the verge of their teenage years and their physical development has reached a point when they are quite capable of participating in a number of activities that were too advanced for them just a few years before. Their coordination is good and they are likely to have developed a certain level of confidence in their athletic abilities. Parents and others who care for kids should encourage them to find a few favourite sports or active games so that they can not only increase their fitness level at this age but for years to come. Friendships are an important part of childhood and between the ages of nine and eleven, kids are quite susceptible to peer pressure. Parents can use this to their advantage by encouraging their pre-teen kids to enroll in sports teams and athletic clubs with classmates and other friends. Many communities offer youth leagues designed for kids just this age. When kids are having fun while they get and stay fit, they are likely to participate willingly and for extended periods of time. No longer babies, kids from nine to eleven take pride in their ability to have a bit of freedom. Around this age, parents typically begin to allow children to walk independently to school, the library, or the houses of friends. They still need supervision, of course, and parents are the best judges of each individual child's readiness, but most kids can safely maneuver walking along roads that are not too heavily trafficked. Many pre-teens often enjoy bike riding, and it should be encouraged. Kids need to be made aware of safe riding practices, including the use of appropriate safety gear, but riding a bicycle provides kids with a terrific workout. The growth that takes place during those pre-teen years is phenomenal -- physically, intellectually, and emotionally. Kids are beginning to have a greater sense of who they are and are learning their place in the world. This is a wonderful time for parents to introduce kids to new things, sports included. Taking them on outings to professional sporting events can spark an interest in participating, making the ticket price a great bargain! It's also important for parents and other adult caregivers to play actively with pre-teen children. They may roll their eyes at the antics of their parents, but kids benefit from seeing that even adults enjoy active play and they will certainly appreciate that their parents care enough to make the time to interact with them. Today's families are undoubtedly busier than those of a generation ago, but parents are as influential as ever. Families who make time to play together not only strengthen their emotional ties, but their bodies as well. Kids should be allowed to help decide what types of activities the family might enjoy trying, preferably on a weekly basis. Bowling, skateboarding, or visits to batting cages are all fun, and are even more so when shared with family members. Even occasional trips to fast food establishments and ice cream shops are acceptable if families walk or ride bikes to get there. Everyone enjoys a sweet reward and when active play is a regular part of life, there is room for an ice cream sundae now and again. 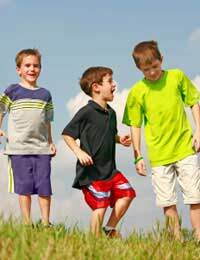 Since their friends are very important to kids, parents may want to allow their children to invite a few friends along on nature walks, hiking trips, or visits to zoos and museums. Incorporating activity into daily life is important for people of all ages -- and whatever steps parents can take to help their kids to become fit and active are well worth the time and effort.